The temp is below zero. Your nose freezes shut when you go outside. Roads are narrow with snow. We take happy pills or drink wine to get through the dark days. Sometimes we gather in coffeehouses, windows steamy; to argue about the Governor, healthcare reform, or the best snowblower. We dream of sun and beaches. Green things. I chop and toss the ice mountains in my yard, trying to make room for the next big dump of snow. I gaze with incomprehension at snowblowers in the stores. So shiny, all lined up from cheapest ($189) to deluxe ($1589). My neighbors all have them: greasy, roaring, gassy monsters. I'm low-tech: I scoop and shovel. Yesterday I bought a roof rake ($39.40). I assembled it with difficulty: the directions were pictures of bolts, nuts, and pipes. I snowshoed around my house and garage, raking snow and ice from the roofs. When a nut fell off and the rake started to fall apart, I repaired it with duct tape. I knocked off icicles and abandoned wasp nests. It was fun. I have 4 studded snow tires on my car. The tires look like they are full of nails. Pretty good in the snow. We've had long dark days. More snow predicted. A January thaw would be good about now. Here's an idea for all you inventors and engineers.... how about putting solar panels on cell phones so we can recharge them in a sunny window? Yeah! How about that? Reading about this miracle man from Brazil: John of God. The visitors to his healing compound wear white. Spirit physicians work through him. He sometimes operates with a table knife. He speaks Portuguese. So I was thinking that AMI and CMI are separate, discrete processes. Nope. You can have both! I'm talking about the human immune response. AMI is antibody-mediated immunity and CMI is cell-mediated immunity. The chemical messengers are cytokines, histamines, prostaglandins, and leukotriennes. (Spell check doesn't like prostaglandins and thinks perhaps I mean prostitution. And for leukotriennes perhaps I really meant to say crestfallenness.) Anyway. I thought AMI led to certain conditions and CMI to others. Today I was reading about RA (rheumatoid arthritis) and trying to figure it all out. See, RA starts out as an AMI process, then CMI jumps in. RA starts with some unknown, unidentified, and probably variable antigen. The body makes an antibody for that mysterious antigen, and this antibody is called RF, rheumatoid factor. They can do a lab test to check for RF in your blood; that helps the physician diagnose the condition. So far this is AMI. Then the RF antibody gloms onto the antigen, they get into a wrestling match and fall down into the synovial tissue of your joint. Now this isn't just one antigen-antibody wrestling match, oh no, it's happening in joints all over your body. When the antigen and antibody hook up, this is called an immune complex. The immune complex, like I just said, falls into the synovial tissue. Let's say it jabs into the tissue. This causes inflammation. Now the cells of the CMI system run over and start multiplying. T cells and cytokines jump in and try to quell the inflammation, but they actually just make things worse. When the T cells attack the immune complexes, it just causes more inflammation and more damage. Tissue erodes. Fluids, connective tissue, and even bone are eaten away by these inflammatory processes. You can see the damage in the fingers, you know, when someone has RA.... their fingers splay out crookedly and their knuckles are all swollen. That's the inflammatory process gone postal. So. RA. AMI and CMI. Too many firefighters at the fire. They get too excited and chop down the house. So yesterday I listened to 5 hours of lectures on Buddhism from Berkeley. Was inspired by lecturer's techniques and information. re Buddhism. If you want want want something and you get it, you won't be satisfied. You have to release the wanting and just be. Example. You want a new electronic gadget because you've been feeling blue. You get the gadget. It isn't enough. You're still blue. hmmm.... Maybe if you upgrade? Yes, it was sunny. Ten degrees F (12 degrees C) but warm enough. I thought of what Pierre said. Pierre is from West Africa: Benin and Togo. He said, "Anyone can live in Maine. They just have to have the right clothes." I picture him fairly bundled up as he said this. 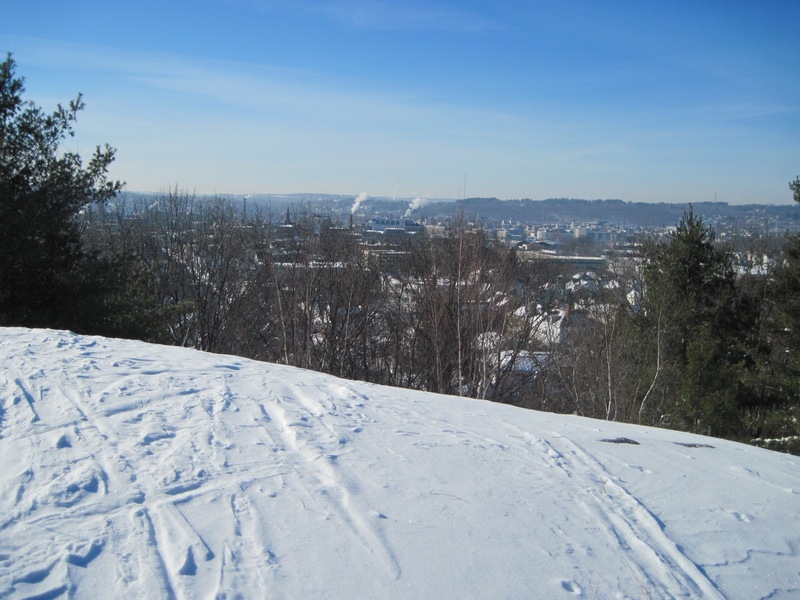 I was wearing 3 shirts, snowpants and jacket, wool and silk hijab scarf, boots, hat, thick gloves, and snowshoes. All quiet and no one else on the mountain. The snow was soft and dry. 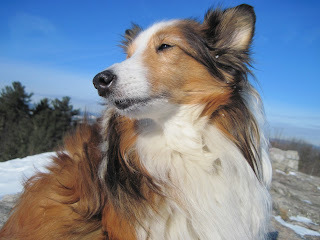 So I snowshoed up, Fluff following happily in the windblown areas, more reluctantly where the snow was deep. I could see sled tracks and beer cans at the bottom; the students are back from Christmas break. 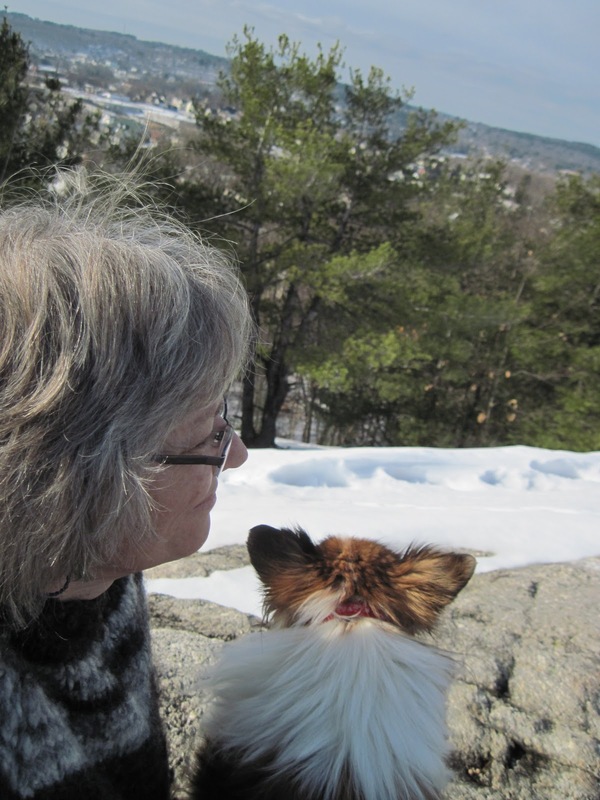 We got above the tree line; the granite top was bare. Sirens rang around the base of the mountain. I saw fire trucks. I started thinking about cytokines. See, I taught inflammation and the immune response this week. A 5-hour lecture. Cytokines are messengers of the immune cascade. They're like fire alarms. They start the whole process of inflammation: the cascade of histamine, arachidonic acid, prostaglandins, and leukotriennes. The cytokines have to get it right. Is it a 1-alarm fire or a 5-alarm fire? If the cytokines don't call enough fire-fighters, then the house burns down. The infection takes over, the person goes septic: they could die. They call in too many fire-fighters? The fire-fighters soak the house with water, chop holes everywhere, the house collapses. Too much of an immune response leads to autoimmune diseases like ulcerative colitis, ankylosing spondylitis, multiple sclerosis, or rheumatoid arthritis. The body attacks itself. So cytokines have to get it just right. The right number of fire-fighters, with the right skills, and the house is saved. People go back in, the house hums with life. Anyway. Those were my thoughts on top of Mt David this morning. Here's a link to an article, Positive Energy. Planning to snowshoe up Mt David this weekend. We got over a foot of snow on Wednesday, and it might rain next week, so this weekend is the time to go. So what's up with the birds and fishes? Seems like every day there are mass quantities of them showing up dramatically dead. Is this a terribly sad manifestation of man? Is it something we humans have done to the environment, to Mother Earth? Is it pollution, noise, or manipulation of energies? Maybe it's microwaves, energy as a weapon, or the shifting of the poles. Or maybe it's The Great Shift. Maybe communities of animals, insects, plants, etc are transcending to another dimension. Maybe Earth is splitting like an atom and populations of birds and fishes are splitting too. Make like a tree and leave. Firecrackers: that's the official explanation. And what about the bees and bats; let's not forget them. They too are having survival issues. My response: reiki. It's all I know to do. Just send reiki to the birds, bees, bats, and fishes. Send reiki to Mother Earth. Wishing you all a very reiki day. So those are the fastest rising google searches. What about reiki? Spiritual path, enlightenment, Earth-splitting transcendence and all of that? Reiki is amazing. Our clients don't just participate in chakra cleansing, obstruction clearing, and energy uploads: oh no. They embark on a spiritual path that takes them... who knows where? One thing I really like about reiki is this: reiki practitioners laugh. Isn't that the best medicine? When I get together with my practitioners we laugh. Clients too. Laugh and cry, just like a good movie. Connect thru laughter today. Who's invented the laughter icon? "lol" is so overused. OK, just had a very reiki 48 hours. Taught a reiki class with people with cancer, did reiki sessions with people with cancer, and did a reiki share with practitioners. It has been very reiki. The best part? I got to do reiki with Kathi. She is a gifted intuitive; she sees so much. She works well with people to help them see. One client today had an amazing life-changing vision while on the table. She met her spirit guide, who gave her advice. She said she felt like she was gone for days. It isn't just reiki, it's a spiritual journey for some of our clients. Reiki Nurse is now available on Kindle. Please check your Kindle Store. thank you. Tiny bubbles are good in Hawaii, but no good in your syringe. See below. So today it was fun with needles. I instructed nursing students on the proper technique for administering subcutaneous and intra-muscular medications. SQ and IM, in nurse talk. We discussed locating anatomical landmarks, selecting the proper gauge and length of the needle, selecting the appropriate syringe, the volume and viscosity of medications, assessing the adipose tissue of the client, Insulin, Lovenox, the 8 rights of injecting medications, the angle of approach, medication packaging systems, the physics of surface tension in drawing from an ampule, how not to lose a finger when playing with EpiPens, tiny bubbles are good in Hawaii but no good in the hospital, and safety features to prevent needlesticks. Tomorrow they will be tested. PS: I would prefer to be on the business end of the needle. Happy New Year! 1-1-11. The dog & I snowshoed to the top of Mt David, here in Lewiston. Sunny and 52 degrees. The snow was slushy, deep in places. We went up through the woods. Saw lots of footprints, no people. The view from the top was amazing. I could see many LA landmarks: the green onion domes of the Kora Temple, Saints Peter & Paul Basilica, Bates campus, and Home Depot at the foot of Mt Auburn. I could hear traffic and sirens from the city below. Heard crows and saw them circling above. I enjoyed the fresh air and good energy. Nice spot, a little bit wild in the middle of the city. 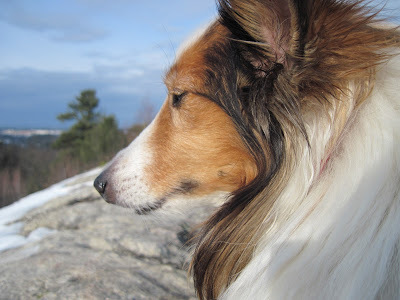 According to mountainzone.com, "Mount David is a mountain summit in Androscoggin County in the state of Maine (ME). 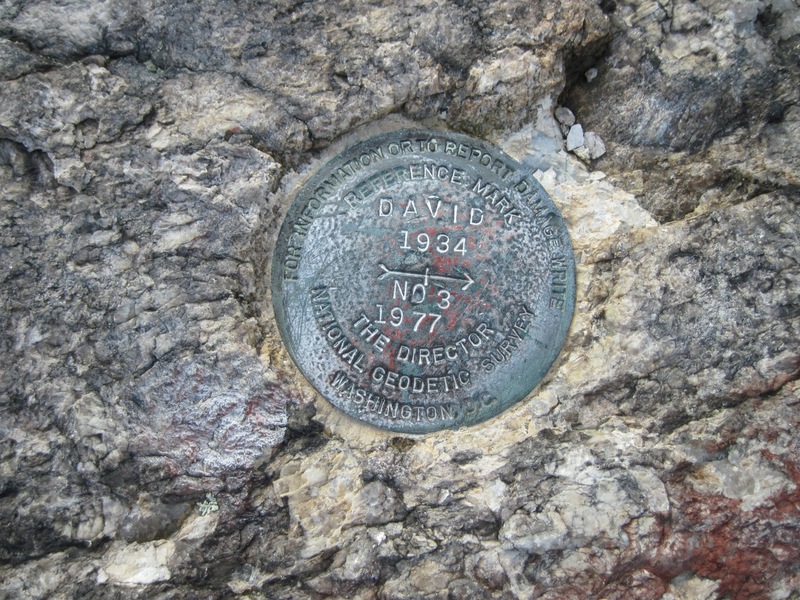 Mount David climbs to 354 feet (107.90 meters) above sea level. 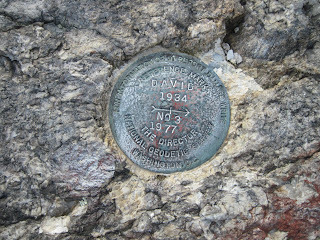 Mount David is located at latitude - longitude coordinates ... of N 44.10674 and W -70.20811."